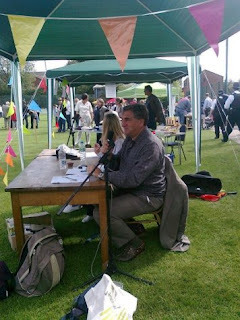 One of the pleasures of writing West Hampstead Life is writing these Insights during which we get to know some familiar West Hampstead faces a bit better, behind the facade even. 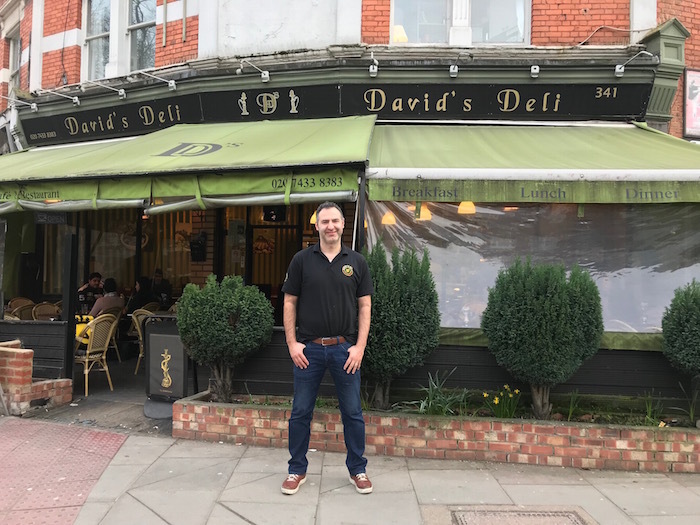 This month’s is no exception as we caught up with Ellias from David’s Deli. 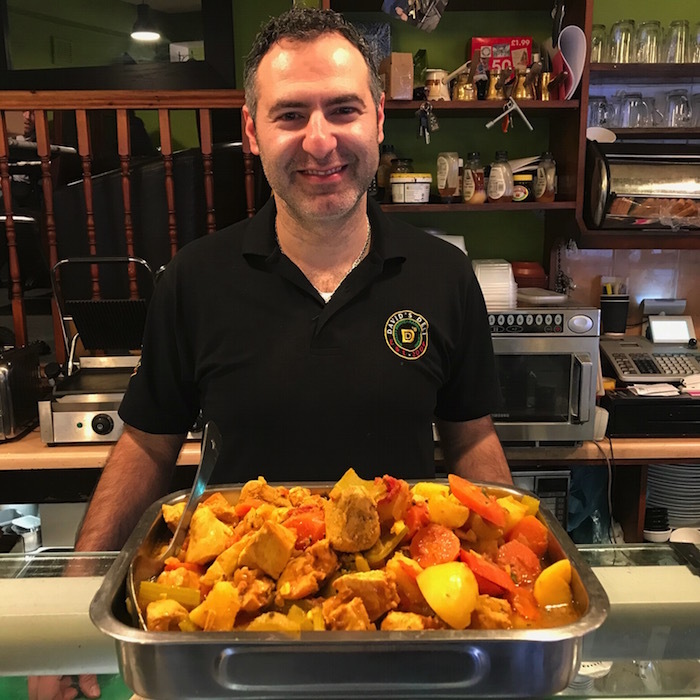 We all know him as Ellias, in fact his full name is Ellias Dbouq; he was born in Beruit from mixed heritage Middle-Eastern heritage, and considers himself Lebanese. When the war broke out his family moved to Germany, where he grew up. Ellias is super enthusiastic about life, David’s Deli and West Hampstead. 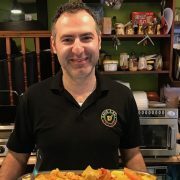 Yes David’s Deli is business but it is also at the heart of the community as a place to eat, meet and greet. But it takes a proactive approach to be so, helping cook for the winter shelter at the church (and handing out 250 oranges). Ellias in front of David’s Deli, West Hampstead. It’s his life! So, what brought you to West Hampstead? “It was accidental really, or perhaps fate is a better way of putting it. It was 2004 and I’d come over from Kiel to visit my brother, who was living in Wood Green. I was looking with a business partner for an opportunity over here and I knew Gaby* and Zak (who worked for Gaby). Gaby saw this site in West Hampstead and suggested we take a look, so I came over to visit with my brother. I had a really good vibe about the place and West Hampstead, so we went for it. And that is how Zak, my brother and Dauod opened David’s (Daoud’s) Deli. *yes readers it is the Gaby of Gaby’s deli on Charing Cross Road, one of Jeremy Corbyn’s favorite haunts. What was your first/fondest memory? “Like I said as soon as I arrived here I felt at home. I remember the first night we opened the deli I went for a drink in what is now the Alice House and met a very friendly reception, chatting with people right away. And I thought, yes I’ve made the right choice”. How has West Hampstead changed? “When I first arrived in 2004 it was very booming and quite mixed but then credit crunch of 2008 hit. It hit the business quite hard as we saw a substantial drop in our earnings. We adjusted our business but after things picked up we noticed a shift in the area by 2011/12 there was more investors money coming”. “When things wobbled in 2008 we had to think about what we could do, extending the day by becoming a shisha bar at night seemed a good option, so we tried it (Ed – with the correct licences he added)! It’s worked well and now adds another leg to the business”. “Here are David’s Deli there’s lots for lunch! We have a new chef who we hired from Maroush, we call him Abu Ali. Since he arrived we have jumped over 4,000 places in the Tripadvisor rankings. 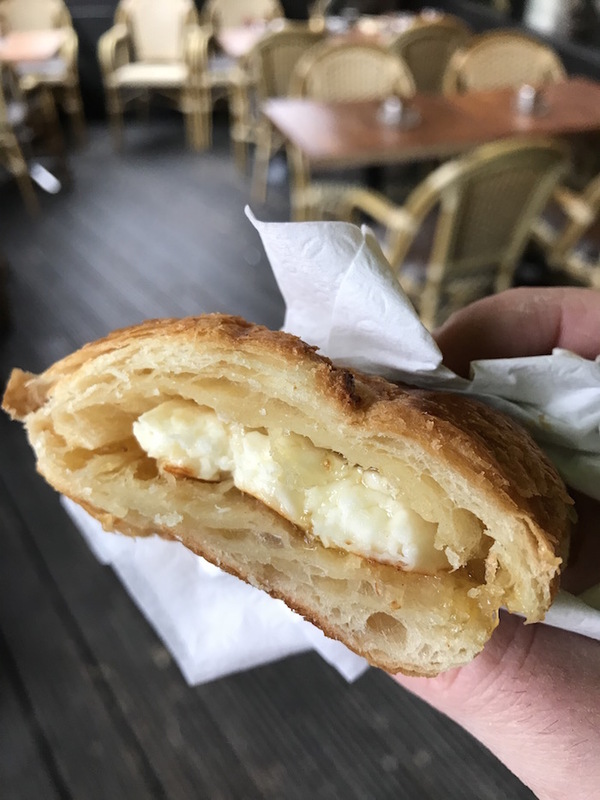 Halloumi and fig jam croissant. Mmmm. “If I’m going out then of course the Wet Fish Cafe which does a professional breakfast and very good coffee. With my wife and kids I’ll go to Locanda 311 we always have fun and enjoy the food”.